Not long before my trip to Norway (blog coming soon, promise!) I packed on some glitter on to the inner corners of my eye. I'm a huge fan of the inner corner highlight, and I've really excelled with it this year too, extending it further up and further down. Also, instead of using the more 'typical' beige-slash-white colours, I began experimenting with slightly less orthodox colours, such as an iridescent blue from Makeup Forever - which, by the way, I completely adore. 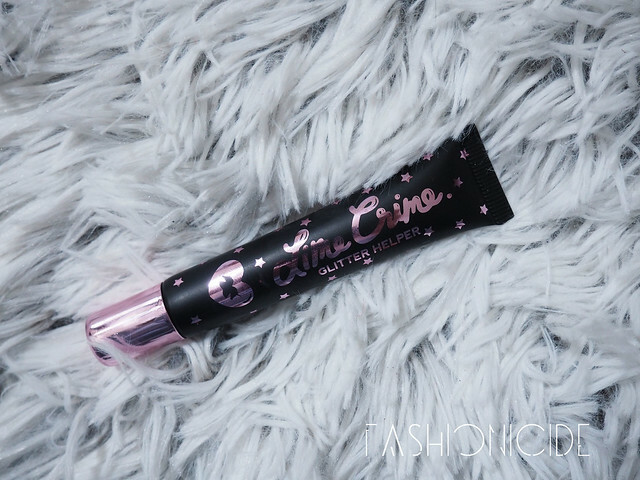 Lime Crime's Glitter Helper is the first thing you'll need. Now I only purchased this a couple of weeks ago as part of my Black Friday splurge, but I am seriously glad that I did. It's not what I imagined it would be, in fact I don't even know what exactly I was expecting, but when I squeezed the tube, out came a thick cream. it wasn't until I applied it to the face that I realised that this was actual glue. Glue for the face! Genius! So, I dabbed the Glitter Helper onto the area where I wanted the inner corner glitter and extended it out a little. I've found that you can't rub this in or move it around once applied as the glue starts to get a little streaky. Stargazer Glitters are *so* underrated. At just £3 each, they're an absolute steal. Each tub contains an awful lot of finely milled glitter, and they do a great job of filtering out the big chunky bits you sometimes find in glitter pots. None of that here. For the look, I tipped out a tiny amount of each glitter into one of the lids and mixed them all together. Then I simply patted the mixture little by little on to the glue until the area became fully opaque and I could no longer see the skin. It really is that simple! If you take a close look at the photos, you can just about make out the individual glitter colours in there, and when you start to move around under various different lighting conditions, the sheen varies with it. As you may have noticed in the face photos, I extended my blusher beyond the cheeks and all the way up to the temples. I had this vision in my mind of Fairies or Nymphs, and imagined that when they blush, more than just the cheeks would turn a rosy red! Maybe that's just me though(?) Either way, I think it turned out rather well, don't you? I am definatly going to be trying this I love it. 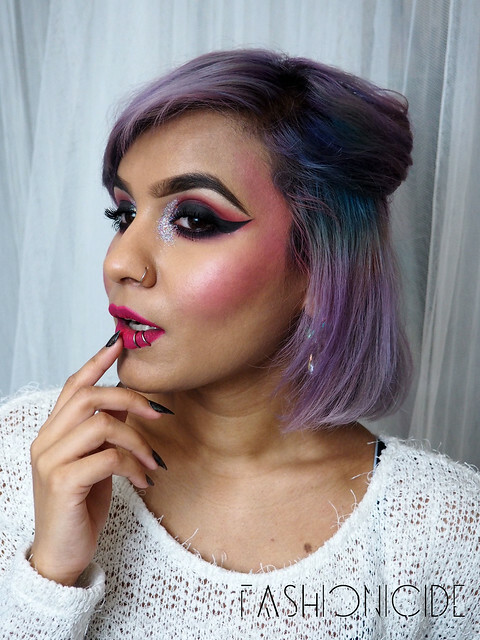 I've been trying a litle flitter inner corner, or sometimes Sugarpill's silver colours. I spilt my favorate glitter all over rescently so I need to get some of these! 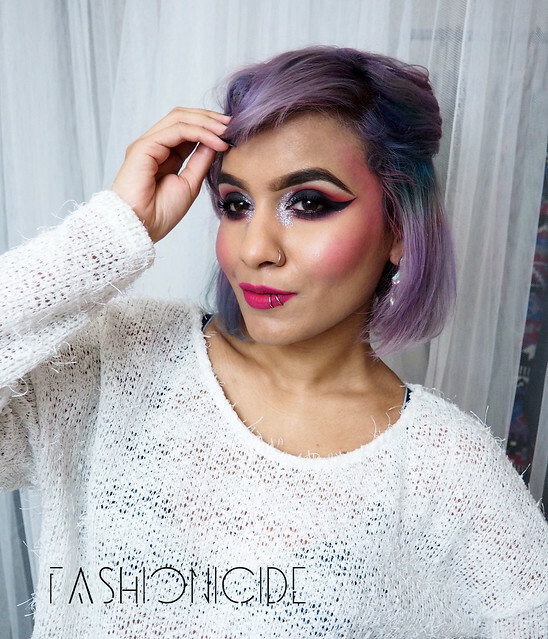 I really want to try something like this for NYE. Thanks Lima. your makeup looks amazing as usual! your eyeliner is always fab! This is epic! A really creative makeup look... love it!